First, whether you are a pro-fracking or pro-Moratorium New Yorker, when you searched the text of Governor Cuomo’s State of the State Address for some variation of “frac,” “fractured,” “frack,” or “frackturing,” you were immediately rewarded with several instances of “FRAC.” Armed with a fresh cup of coffee or some sedative, you prepared to delve into the convoluted shoals that are Cuomo’s gas extraction policy. And that’s where you encountered the first multi-layered irony. During the past month, activists sent New York’s Department of Environmental Conservation (DEC) more than 200,000 comments about the Agency’s regs, draft SGEIS, its review process and lack of adherence to State law. Many of those comments were submitted “under protest” and came on the heels of more than 60,000 submitted during the last round of dSGEIS comments. But the “FRAC” in the Governor’s speech didn’t refer to gas, extraction or hydraulics. It’s the Food Research and Action Center which studies accessibility to “affordable fresh fruits and vegetables” and the impact of that accessibility on health. It is a notable initiative but kind of moot if New York’s fertile foodsheds are fracked. You settled in a little deeper and began to review the State of the State Address category-by-category. The Governor spoke to the Economy of Tomorrow and laid out a plan to Make New York the Leader in the Clean Tech Economy. He pledged himself to the creation of a workforce capable of meeting the new demands of his 21st century model. … as stated in sub-section 7.1.3, the Department proposes that for at least two years the surface disturbance associated with high-volume hydraulic fracturing, including well pad and associated road construction and operation, be prohibited within 500 feet of primary aquifers. … uncovered pits or open surface impoundments that could contain flowback water … are subject to a 300-foot separation distance from water wells under Appendix 5-B of the State Sanitary Code. Flowback water tanks and additive containers … which require a 100-foot setback from water wells. Handling and mixing of hydraulic fracturing additives onsite…requires a 150-foot distance from water wells. The Department proposes that it will not issue well permits for high-volume hydraulic fracturing within 500 feet of a private water well or domestic-supply spring, unless waived by the landowner. 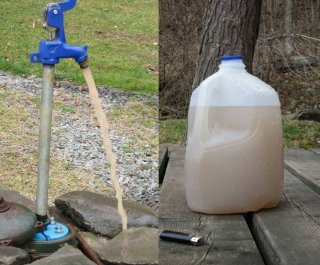 If those “set-back mitigations” strike you as inadequate, then add this nugget to the sludge on your plate: gas wells in New York State will be permitted within 150 feet of schools. That’s right. As Cuomo outlined a broad range of education improvements with optimistic headings like, more learning time, full-time pre-k programs for highest needs students, better teachers, principals and evaluation systems — all excellent proposals — his SGEIS will allow gas wells to be drilled within 150 feet of those excellent teachers, students, playgrounds, programs and classrooms. No doubt, Disassociative Policy Disorder strikes again. Yes, while painting a rosy picture of New York State’s schoolchildren being educated for the 21st century in a state fueled by sustainable industries and locally-grown food, Cuomo’s SGEIS has determined that many New York schools and much of our vast foodshed will be left vulnerable to the dangers of crazily inadequate setbacks. Worse, even if the setbacks seem a dandy solution to you, consider that you and the Governor have overlooked another threat to foodsheds in Upstate New York and the Upper Delaware River Basin: migrating air pollution from the Hancock compressor, the Millennium Pipeline and other components of the extraction industry. Fingers crossed that if airborne contaminants endanger the Organic status of local Upstate NY farms, Vermont won’t charge much to stock NY’s school lunch programs. In addition to educating our children and feeding them more and healthier local food, the Gov is determined that New York will Set the “Gold Standard” for Patient Care. “The best way to improve the health of New Yorkers and to lower health care cost is to avoid preventable illness and the health care interventions they require,” he said. He even devoted 7.5 typewritten pages to sepsis, “An overwhelming immune and inflammatory response to infection.” He laid out an entire plan of attack to improve preventative care and to combat nosocomial infections. He was inventive and passionate. He skipped over the fact that his SGEIS has been roundly decried by doctors, medical societies, nurses and epidemiologists for ignoring the cumulative impacts of gas extraction on human health. He forgot to mention the plethora of reports coming in from the frontlines of Gasland about endocrine disruptions, immune system dysfunction and leukemia. He ignored that gas extraction and production companies are exempt from revealing the toxins they use in their processes and that doctors are prohibited from telling injured patients the nature of the gas production toxins that have harmed them. Yes, Governor Cuomo, but perhaps there are industries and devices “so lethal that we simply cannot afford” to welcome them into our communities, either. Then why, oh why, Governor Cuomo, did activists have to labor so hard to expose the fact that Independent Oil and Gas Association (industry lobbyist) worked hand-in-hand with NY’s Department of Environmental Conservation to write our State’s gas extraction regulations? Although the Gov is referring to homes damaged or obliterated by Hurricane Sandy, the door he opens is intriguing. Will those whose properties are damaged or destroyed by their neighbors’ fracking also be considered “vulnerable?” Will those property owners also be helped to relocate? Will they be helped to find a new and better quality of life? Will our organic farmers be rewarded with new sources of clean water and soil? And when Cuomo says that, “Much of New York’s infrastructure is aging and susceptible to damage from extreme weather events or seismic threats,” is he planning to replace bridges, roads, and neighborhoods impacted by frack-created earthquakes? Or when he admits that, “there are miles of aging [ gas] pipeline[s] that are prone to leakage and vulnerable to storm damage (and ground movement) [in New York State],” does he intend to hire hundreds of new DEC field agents to police, test and enforce remediation of those leaks? Or will citizens be detailed to stand on either side of the pipes to hold them in place as they rock to the beat of seismic drums? And when he says we need to “strengthen our wastewater infrastructure” because, “Flooding and storm surges from Lee, Irene, and Sandy resulted in hundreds of millions of dollars of damage to waste water treatment plants and the release of hundreds of millions of gallons of raw and undertreated sewage,” is he considering just how toxic the stew would be with Marcellus Shale’s radioactive materials added to the mix? Or does he believe that his newly-minted World-Class Emergency Response Network — like All the King’s Horses and All the King’s Men — will simply put New York back together again after the extraction industry has bedded, fracked us, and moved on? As part of Governor Cuomo’s plan to “Harden Our Utilities,” he wants the following NYS Public Service Commission (PSC) recommendations adopted as soon as possible. It sounds dandy, actually. Too bad these initiatives don’t extend to the Department of Environmental Conservation or the gas extractors that Agency is mandated to regulate. The PSC will be statutorily authorized to levy administrative penalties against each utility for violations of PSC orders and regulations or upon a finding that such utility has failed to provide safe and adequate service under a “reasonable business” standard (comparable to the prudence standard). The size of the potential penalties will be increased, and provisions will be adopted to ensure that the penalties are paid out of shareholder capital and not passed on to ratepayers. The PSC will be authorized to issue an order that directs a utility to comply with recommendations made pursuant to management and operations audits. The PSC will recommence operational audits at least every five years as currently required under the Public Service Law. To implement the strengthened auditing functions of the PSC, consideration will be given to having a dedicated auditing unit to help ensure that the PSC is well-situated to fully exercise its statutory authority and perform both management and operational audits. Consideration will also be given to creating a dedicated unit for investigating and enforcing utility compliance with PSC orders and recommendations and with utility tariffs. Statutory changes should be considered to explicitly authorize the PSC to formally review the performance of each of the Investor-Owned Utilities to provide safe and adequate service, and order appropriate relief including divestiture of some or all of a utility’s assets, subject to both due process standards and the need for continuity of service. To ensure compliance with the recommendations put forth by the PSC after a review, the Commission also recommends the clear establishment of the PSC’s authority to revoke the Certificate of Public Convenience and Necessity. DPS staffing and budgetary levels will be reviewed to ensure they are sufficient to carry out the newly-designed core functions of the PSC, and procedures should be reviewed to ensure cross-training of the existing workforce, implementation of performance management standards and technology upgrades. Given the substantial retirements at DPS in recent years, the agency currently is not staffed to the level authorized in the FY 2012-13 budget of 524 full-time employees (FTE). Based upon the additional mandates that the Commission recommends, the DPS staffing authorization will be maintained in the FY 2013-14 budget and DPS will recruit and hire up to the 524 FTE allotment to assist in implementation and enforcement of the new mandates. Similar to Sarbanes Oxley where CEOs need to certify the validity of their financial statements, consideration will be given to requiring senior officers of each utility to annually certify to the PSC that the utility is acting in compliance with all applicable State laws, rules, regulations, orders, and procedures, including the statutory requirement to provide safe and adequate service. All appointees to the PSC will have demonstrated competence in some aspect of utility regulation as well as a concern for the public well-being. Sections 345-38 of the proposed Bethel law would explicitly prohibit injection wells, natural gas and/or petroleum exploration activities; natural gas and/or petroleum extraction activities, natural gas and/or petroleum extraction, exploration or production waste disposal/storage facilities, natural gas processing facilities, underground injection, high-impact uses and other specified activities. (Breathing Is Political left the Bethel Town Board’s March 15, 2012 Hearing on Town Law No. 1 of 2012 about twenty minutes before its finish. At that point, thirty members of the public had spoken in favor of the proposed law which would ban high-volume hydraulic fracturing as a high-impact activity in the Town and four members had spoken against the law and in favor of permitting H-VHF activities. According to Larysa Dyrszka, supporters of the legislative ban collected more than 500 petition signatures and at least 100 letters. Sections 345-38 which explicitly prohibit injection wells, natural gas and/or petroleum exploration activities; natural gas and/or petroleum extraction activities, natural gas and/or petroleum extraction, exploration or production waste disposal/storage facilities, natural gas processing facilities, underground injection, high-impact uses and other specified activities. Richard Gebel and many other speakers spoke to the natural beauty of Bethel that might be laid waste by high-volume hydraulic fracturing. Eric London, a physician and researcher remarked that to begin fracking without a health impacts study would be unethical and he commended the Town Board for its efforts to protect the residents of Bethel. Ronald Turner said, “This is a big moment for the Catskills. It might be the biggest since our towns were flooded to create the reservoirs. Fracking is not conducive to the qualities that draw people here.” He asked what would happen as the underground infrastructure that’s necessary for H-VHF begins to decay. “Who will monitor that decaying infrastructure,” he asked. In addition to the many Town of Bethel residents who spoke, residents from the Towns of Delaware, Lumberland, Cochecton and Callicoon were also in attendance, due, presumably, to the potential for natural gas exploration, extraction and processing activities being conducted in their Towns. For more information on moratorium efforts, The Community Environmental Defense Council — David and Helen Slottje — is the non-profit public interest law firm based in Ithaca, New York that worked — for free — with Bethel and many other Towns in New York. Fifteen minutes before the 6:30 start time, Bernie’s parking lot was full and cars lined the side of the road. The meeting opened with remarks by IOGA-NY’s reps who boasted degrees in hydrology, geology and jurisprudence. They were, with the exception of the attorney, folksily garbed in blue jeans and low-key short sleeves. The audience settled in to view, “Homegrown Energy,” IOGA-NY’s self-described “educational” film which provided a cartoon-style description of the drilling and hydraulic fracturing process. The cartoon attempted to allay fears concerning the toxic ingredients found in hydraulic fracturing fluid (“mud” — which is injected through the well bore under enormous pressures in order to fracture the shale bed and extract the natural gas contained there.) According to the educational film, the “mud” contains a soup of additives necessary to the process which are commonly found in antibacterial hand washes and dish liquid. Industry reps at the Rock Hill meeting denied that “mud” used at their wells will contain toluene even though “Benzene, toluene, ethyl benzene, and xylenes are naturally present in many hydrocarbon deposits, and may be present in drilling and fracking chemicals.”) Indeed, the EPA’s 2004 report also states that not all of its listed toxins are present at all fracking operations. This inconsistency and the fact that “The 2005 Energy Policy Act excluded hydraulic fracturing from [Safe Drinking Water Act] jurisdiction,” are why Representatives Diana DeGette and Maurice Hinchey among a few others have introduced The Fracturing Responsibility and Awareness of Chemicals Act, which amends the Safe Drinking Water Act. Some residents living near Texas’ Barnett Shale disagree. When the IOGA-NY geologist was questioned about reports that hydraulic fracturing had stimulated earthquakes, the geologist claimed to have never heard such allegations. Further, he denied knowing anything about New York State’s history of earthquakes. In another back-and-forth having to do with water contamination, IOGA-NY reps told the audience that New York State’s Department of Environmental Conservation is one of the strictest and best environmental enforcement agencies in the fifty states. In consequence, he added, New York residents won’t experience the same kinds of problems encountered by residents elsewhere. When Breathing asked if strict oversight would be required in New York to keep us safe from the Industry, the response was, “Gas drilling is an industry. Industrial accidents happen.” In a follow up question, Breathing asked how many DEC oversight and enforcement personnel would be required to keep our environment safe from the Industry. I got the same answer from IOGA-NY as was offered by the Delaware River Basin Commission on July 15, 2009. No answer. ***Breathing endorses this suggestion wholeheartedly by offering the letter-writer a column here. While the rest of us stumble in the dark looking for a way to bridge the divide between “pro-drillers” (a misnomer) and “anti-frackers,” (please!) she offers a way to cooperate for the good of us all. ****A request with which Breathing complied immediately. I promised yesterday to provide you with a short primer on “How to organize a 330-mile party in under five weeks for less than $1,000” so, gather round. 1. The first thing you need when trying to organize a community is a good idea. It should be easily explained and understood and it should include a component of fun. (Your idea for filling the shale bed with toxic chemicals and consequently polluting the land and water is easily enough understood and explained but honestly, the “fun” piece is missing.) For instance, my idea for Lighting Up The Delaware River Party came from Gandhi leading the Indian people to the sea to make salt. He wanted them to reclaim their resources and the strength that comes from working shoulder-to-shoulder in an act of solidarity. So we started with that idea and added puppets, songs, movies, dance, poetry, a canoe regatta, campfires, kayaking. It was a blast! What’s the genesis of your idea? This is important! When I asked one of your spokespeople outside the July 15, 2009 DRBC hearing if he’d be willing to put your toxic chemicals in an impermeable container and then place them in his child’s glass of water, he said, “No!” without hesitation. It’s just not a good way to garner trust and support. And more important, it’s just not fun. And for sure, it doesn’t help your case to simply deny there’s a problem. Granted, most of us who’ve been living in The Basin or rural New York, Colorado, Wyoming, Pennsylvania, Texas, Louisiana and Ohio for decades or centuries don’t have a lot of financial resources but we’re not stupid for Pete’s sake. We can read a local newspaper! We know about Dimock, PA, Texas, Colorado, Wyoming, Ohio… It doesn’t help your cause if people think you’re hiding a bunch of garbage in a closet. So in your interest, I urge you to come clean. Vest yourself in the community. I know it’s not a tact you’re familiar with so it bears some explanation. For instance, you can volunteer to help farmers get the hay in during the season. You can deliver cups of coffee to our volunteer firemen who work long hours all day and then roll out of bed when the fire alarm peals. If that sounds like overkill, at least provide jobs for local people. They’ll remember you fondly, I promise! Support the Fracturing Responsibility and Awareness of Chemicals Act of 2009 so all the nervous Nellies out there feel appeased and safe. If history’s a clue, you probably won’t have to fix any of the problems you create but at least you’ll look responsible. Pay the damned severance tax you convinced Pennsylvania Governer Rendell to pull. Are you nuts? (I’m asking as one organizer to another so don’t get in a huff.) The tax will cost you barely anything in the billion dollar scheme of things and it’s great publicity. Pay the tax and look like a regular guy. You can’t buy that kind of good press. Another big help is to know your local media and be trusted by them. I’ve got to hand it to you on that point. The work you’ve done with the media in Wayne County, PA has been inspirational! Almost as impressive as the national silence on some of the “ooops” factors you’ve precipitated in Dimock, Fort Worth and elsewhere. And that’s where I think we can collaborate. I’ll introduce you to the crackerjack local media who’ve remained beyond your reach and you can get me 10 minutes on Lou Dobbs. First, I want to tell you how much I appreciate your frequent visits to this site, Breathing Is Political. Some of the “hits” are probably “ping backs.” (I don’t really understand all that blog stuff either, so don’t be embarrassed.) I do notice, however that some of your visits have lasted long enough for a good read. Great! I also want to express my personal gratitude for the informational sessions you’ve planned in New York. I genuinely appreciate having this opportunity to hear about all the benefits in store for us in Sullivan County. I’ve included links for your convenience here because you might not remember where Sullivan County and the Delaware River Basin are. I know how busy you’ve been in Dimock, Pennsylvania, Fort Worth, Texas, Pavilion, Wyoming and so many other places where drilling is creating whole new landscapes and jazzing up the water with an array of additives. Just one quick update about our Light Up The Delaware River Party last night because I know you’re interested. Evidently, a couple of Pennsylvania river officers were forced to eject three middle-aged people from a PA access site. The three revelers were preparing to pour cups of clean water into the River or something bizarre like that. Sigh. What can ya’ do, right? (Turned out there were nearer 20 participants for the candle lighting on the Bridge but more about that tomorrow.) I did hear reports that one of the agents looked “a bit sheepish” about the role he was playing and happily, neither officer felt the need to unholster his sidearm. Thank goodness, right? Sorry for that diversion. My Granny-something brain is easily distracted. Since your interest in my modest little rag sheet has been rewarding for you, I’m posting this letter to other blogs. I’m sure they’ll do everything they can to encourage lots of interest in, and attendance at, the upcoming promotional events you’ve scheduled for New York State. And there are supportive documents at Governor Paterson’s site, aren’t there? I know he’s getting pretty excited about all the gas dollars waiting to be plucked from the Marcellus Shale in New York. But don’t worry yourself over the details. We’ll have you covered. FYI: Coming tomorrow, “How To Light Up The Delaware River in under five weeks for less than $1,000. (Hint: it starts with an inspired idea. Mine came from Gandhi. And yours…? What with your millions? billions? for national TV ad campaigns, you’ll find our grassroots efforts interesting in a folksy, anthropologic kind of way. Enjoy! Find out what events are planned for your stretch of The Delaware River. NB: Last night, I told you CottageWorks was hosting the “Light Up The Delaware River Party because we hadn’t had a chance to create a stand-alone site for it. When I woke up this morning, I had an email from the indefatigable Tanyette. During the night, she’d created the site and sent it live. I’m still stunned by her determination and energy. Thank you, thank you, Tanyette!